You can read a short introduction about “why catechisms” by clicking HERE – it will give you some thoughts about why this is such a helpful tool for you and/or your family. Since I did not start this the first week of the year I am using this post to play a little catch up. I have included the links for the first 3 questions of the catechism. Feel free to look at all 3 or just start with #3 this week and keep going. Take some time to familiarize yourself with the site. 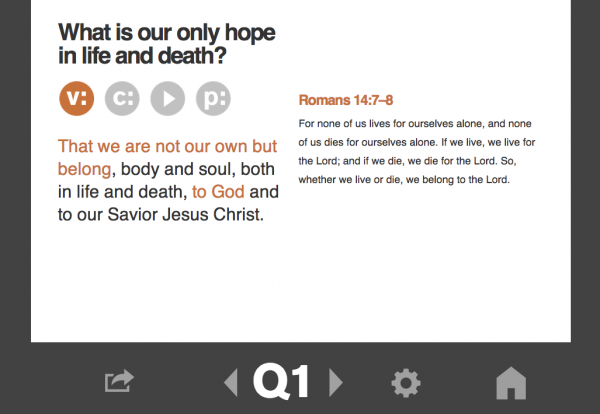 It is not at all complicated and will give you several ways to help teach the doctrinal truth each week: Q and A, a short video (V), a short commentary(C), and a prayer(P). It’s good stuff. Holler if you have any questions about how it can help you and your family.